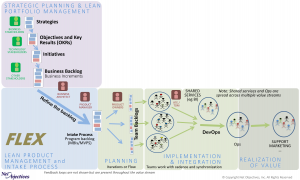 FLEX (FLow for Enterprise Transformation) is an operating model based on systems-thinking, Lean-Thinking and the principles of product development flow. Its intention is to help guide organizations in achieving business agility – the quick realization of value predictably, sustainably and with high quality. It accomplishes this in a guided process that enables us to create an approach contextualized for us, but created from existing process patterns so that we do not need to reinvent the wheel. FLEX can be used to start with a tailored framework which we adjust over time as our skills increase, the understanding of your challenges deepen and as your organization changes. We can think of FLEX as providing us with a way to create an emerging framework controlling its emergence to be at the pace we need. FLEX takes advantage of other frameworks and methods by considering them tools to be used as applicable. FLEX can therefore provide a well-defined starting point based on another framework (such as Scrum or SAFe) or based on an analysis of where your organization is and what would be most appropriate for you to use. This enables FLEX to be tailored to any organization. How to improve from where you are is accomplished by attending to established Lean principles to guide next steps for improvement. This also means that you never outgrow FLEX in that it can automatically incorporate new ideas that are needed. FLEX guides us in achieving business agility by focusing on reducing the cost of delay in delivering value. 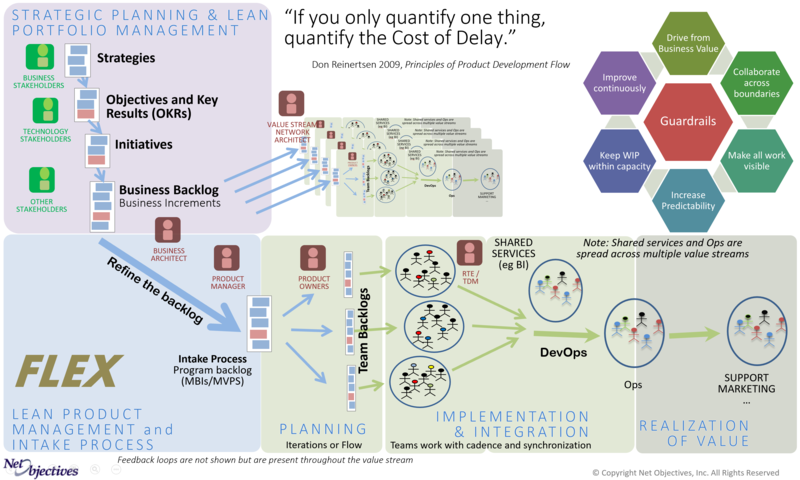 “Cost of delay” is what it costs an organization in lost revenue, lost opportunity, increased risks, customer respect, etc., due to a delay in realization of value. Cost of delay can be reduced by focusing the enterprise’s capacity on what will achieve the greatest value in the shortest amount of time. It can do this by allocating the organization’s capacity to these items of greatest value. This is the effectiveness aspect of the equation. It can also become more efficient by attending to, among other things, the workflow being used, the structure of the teams involved, the size of the items being worked on, the number of the items being worked on, the visibility of the work and the agreements among the people in the organization. How changes are introduced and the roles of leadership and management is also critical. Add roles necessary to the creation of flow. The figure shows these as part of a typical workflow. Click here to get a copy of the FLEX Flow Picture. In a nutshell, discover what is most important, organize your people and allocate the capacity to the most important work. How each of the above actions are accomplished needs to be tailored to the company adopting the transformation. However, there is no reason to re-invent the wheel as patterns for all of these exist and can be readily applied to the organization. We must contextualize the approach to the organization while providing a concrete starting point. This tailoring has two steps. An initial phase to get you started and a continuing phase for ongoing improvement. 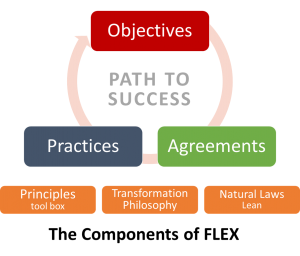 The path to success is guided by attending to your objectives, specific agreements you make with each other, and the practices you follow. These are built on a foundation of Lean-Agile principles, FLEX’s transformation philosophy and natural laws of product development. It is important to have people make agreements that are organized around working together, not merely following an approach. These are laid out in our guardrails system. FLEX can be used for any size organization. We call it an ‘enterprise’ transformation because FLEX addresses issues from the beginning of the value stream through deployment. The value stream can be thought of as all of the steps that your work goes through from the initial concept until the value is realized. FLEX can stand on its own or can be laid on top of methods such as SAFe® (either to enhance it or to use it as a guideline). If you are doing SAFe or considering it, see the SAFe® and FLEX page. FLEX takes what is known and provides a way to make a customized roadmap for a company’s transition. FLEX is not limited to any one approach but incorporates what works from all other methods. FLEX’s power is in how it makes those practices available to the current context in which it is being used. One of the key aspects of FLEX that differentiates it from frameworks such as SAFe, LeSS, DAD and Nexus is that it is not just a framework but more of a way of thinking and an approach to manifesting improvement. No one-size-fits-all so you are almost certainly committing yourself to an approach that is not tailored for your organization. The commitment required does not allow for pivoting after a quick start. You typically start by committing to following an approach instead of taking quick advantage of what you learn from a small, initial engagement. You should undertake an Agile engagement in an Agile manner. That is, do something small, learn, adjust, do something more. This eliminates this seeming dilemma by providing people in the organization a straightforward, well-defined improvement step to begin with. Once enough progress has been done, the next step can be defined. While FLEX may initially require someone with experience to guide you, you can quickly learn how to guide yourself since it is based on principles and laws of software development. Once these are understood, you can determine your own path. See How FLEX is different from Agile Approaches for more. Progress is guided by two types of metrics. The first is how much value is being manifested. The second is how well you are improving your development methods. How to navigate FLEX. This site has been designed so you can self-navigate to your topics of interest. The top level is this page and the Steps of FLEX to the right. Go through and read each of these pages first, visiting links on a page only when you don’t know a term or when you want to go deeper right then and there. Each page also has Resources on the right that go deeper into related topics but are not needed for an overview of FLEX. For a 45 minute overview of FLEX click here.